Viceroy’s House – Entertainment Ave! 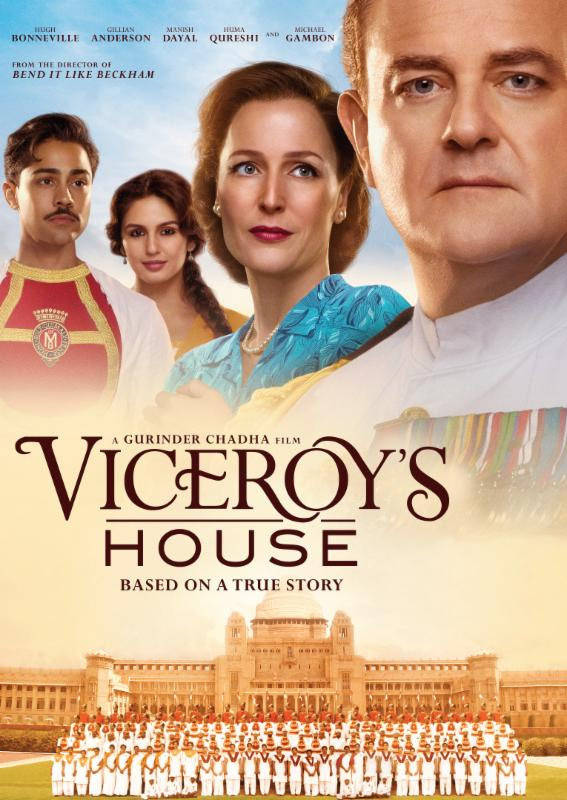 In a nutshell “Viceroy’s House” is about the last days of British rule over the folks in the area of India. The problem is that, at the time, along with independence, there was the internal squabbles of the Hindus and Muslims. They each wanted a piece of the pie, so to speak. The solution? As part of the deal for independence there was the creation of Pakistan so that the Muslims could have their own land. In the movie Lord Mountbatten (Hugh Bonneville) gets sent to New Delhi to see that the transition away from British rule goes smoothly. Along for the ride is the Lord’s wife, Edwina (Gillian Anderson). They end up in the mansion labeled “Viceroy’s House,” and only then does Mountbatten realize the crap job he has ahead of him. Yup, the Muslims and Hindus keep fighting each other, there are shady deals so that the Muslims can get what they want and Britain can protect their oil interests, and through it all is Edwina. She’s different from most British women, it seems, because she actually cares for the people. Along with her caring she wants to leave the country in a better state than it is at the time. She witnesses how miserable the place is, and thinks things like schools and infrastructure should be fixed before the British get out of dodge, or India as it would be. Along for the ride is a love story between Jeet (Manish Dayal) and Aalia (Huma Qureshi). You might wonder why this is an issue. Well, Jeet is a Hindu while Aalia is Muslim. Though not the greatest of circumstances while Britain ruled the land, they were starting to figure how to make their love work. Now that there was a separation coming between the Hindus and Muslims, yup, our lovers have to make a choice of where their hearts really lie. The Partition of India, as the division of the land came to be known, created havoc. “Viceroy’s House” does its best to show the struggles of both Muslim and Hindu without going overboard. Refugee camps get set up, there’s a lot of violence and mistrust amongst people, and the exodus of people to and from the land that would be Pakistan changed the direction of many people’s lives. The acting of Hugh Bonneville as the Lord is wonderful as he begins to realize the chaos he is now a part of. This is also one of those movies that reminds you that Gillian Anderson is so much more of an amazing actress than her being Scully on The X-Files lets her show. The love story, though I suppose necessary, seemed at times too contrived, with over-acting of the pain and suffering of the lover’s separation. At the end of it all I learned a lot, although it is movie learning. It did, however, cause me to looks up some of the history of the Partition of India, and how India’s independence and Pakistan’s creation really came to be. With that I think the movie does its job. With some awesome scenery, great lead acting by Bonneville and Anderson, and my learning something, I’m giving “Viceroy’s House” 4 stars out of 5. It’s a drama with some cute moments, but there wasn’t a lot of good going on at the time. “Viceroy’s House” did a great job showing the turmoil.